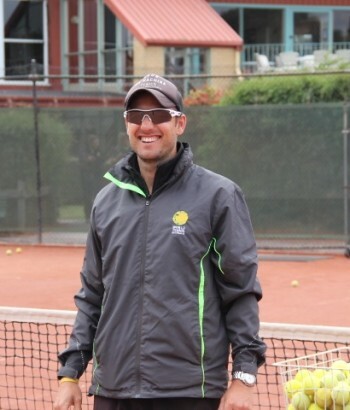 Brad is an enthusiastic coach, who can adapt and relate to all people and tennis abilities. His aim during sessions is to implement sporting equipment to help players develop their coordination and athletic development whilst learning in a fun and safe environment. With Over 12 years coaching experience, Brad has been coaching at BETA (Berkhamsted elite tennis academy) UK since 2008 to August 2014 in conjunction with Tyrell Diaz Stevens. He has coached elite juniors aged between 7-18 including highly ranked national players such as Joel Pierleoni (11 years old, UK) and Anna Popescu (17 years old, UK) and has Extensive adult coaching experience from private lessons to group coaching. Brad has traveled with players to over 15 countries as a coach/manager, including numerous visits to the Orange Bowl in the USA, a 2 month contract in Canada coaching in Toronto 2008 and as a travelling coach to Rameez Junaid current ranked #65 in the ATP doubles ranking, throughout 2014. Brad has continued to learn from the best coaching alongside coaches Javier Capataine (founder fitcoaching designs) who has worked with Dimitrov, Sharapova and Fognini and Rainer Bopp (Germany) who has coach many professional players and now brings this expertise to the World Tennis Australia team.